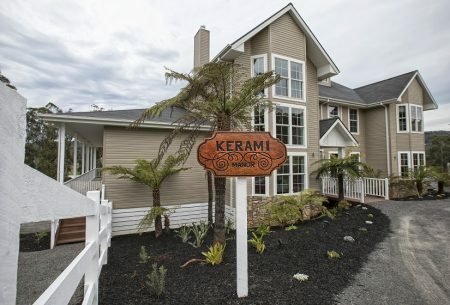 Formally Kerami Guest House, the new grand manor house has beautiful views on the deck overlooking Marysville. Kerami Manor offers an elegant, grand atmosphere – the only of its kind in Marysville. Treat yourself to a fully hosted dinner or Bed and Breakfast. Whether you’re enjoying a privately hosted getaway in a group, with your loved one or retreating solo in winter or summer, you’ll be thrilled with the amenities and location of Kerami Manor. Relax in the tastefully furnished, large, formal lounge room, or enjoy a delightful, seasonal meal in our dining room which can cater for twenty guests and their visitors. Relax in one of our two informal lounge areas and a guest refreshment area is also available for your use during your stay. Unwind in any of our lounging areas which are perfect for sitting and enjoying the newspaper or for having a chat over a glass of wine. We’re proud to operate Kerami House as a reflection of Marysville’s history, and hope you’ll join us by the fire during your stay.